Articles | Gasmaster Industries Ltd.
Boilers used for domestic water and space heating are one of the highest energy consumers in residential and commercial facilities. After the global energy crisis in the 1970s, higher fuel prices prompted the search for solutions to reduce energy consumption. Back then, conventional steam boilers were the only option available. However, these boilers were very inefficient (due in part to the unrecovered latent heat losses from the fuel combustion process) which eventually led to the advanced development of high efficiency condensing boilers. Ideally, condensing boilers would operate as designed – condensing as expected and delivering the highest efficiency possible. However, in reality, external variables create unwanted problems, affecting the boiler’s efficiency. To ensure that condensing boilers are operating at maximum efficiency, effective controls and operation become crucial. The load on a boiler constantly fluctuates depending on the weather conditions, occupancy rate, internal heat gains, and other variables. Therefore, effective boiler control can significantly affect energy use that may have resulted in system inefficiencies, increased utility costs, unit downtime and costly unscheduled maintenance. In the past, boilers were designed with only one mode of operation – on/off burner control. As innovation was added into boiler designs, manufacturers began offering units with multiple firing rates followed by units that could modulate seamlessly between a fixed low and high fire rate based on requirements. This reduces the number of on/off cycles resulting in increased efficiency. On start-up and shutdown, the boiler goes through a pre-purge and post-purge cycle that would result in heat losses affecting the boiler efficiency – the extent of these losses depend on boiler construction, type of application, and design of the system. How far the modulation goes from full fire rate is determined by the turndown ratio. The turndown ratio is defined as the ratio of the maximum fuel input rate to the minimum fuel input rate of a modulating burner. It is used to help determine how low a boiler can modulate before it turns off. Boiler turndown is important for fuel savings—especially during low-load conditions and also reduces the wear of burner components. Example: if a 2,000,000 Btu boiler has a 5 to 1 turndown it is capable of modulating from 2,000,000 Btu to 400,000 Btu. The larger the turndown the closer the modulation can adjust to the required heat load, however, flame stability becomes more difficult in lower turn down as less fuel and air within the same sized combustion chamber become less stable due to lowering the combustion chamber pressure. This is when manufacturers have no other choice but to increase the excess air within the given combustion process to maintain stability. To understand why this is done, let’s look closely at the boiler combustion process. Boilers generate hot gases by combusting a fuel in the presence of air and then transferring the thermal energy from the hot gases to water. The combustion process is, therefore, an important factor in the efficient operation of a boiler. Stable combustion conditions require the correct amounts of fuel and air. In theory, there is a specific amount of air required to completely burn a given amount of fuel for combustion. This type of theoretical complete combustion is called the stoichiometric combustion. In practice, however, burning conditions are never ideal. Therefore, more air than ideal “excess air” must be supplied to burn the fuel completely. 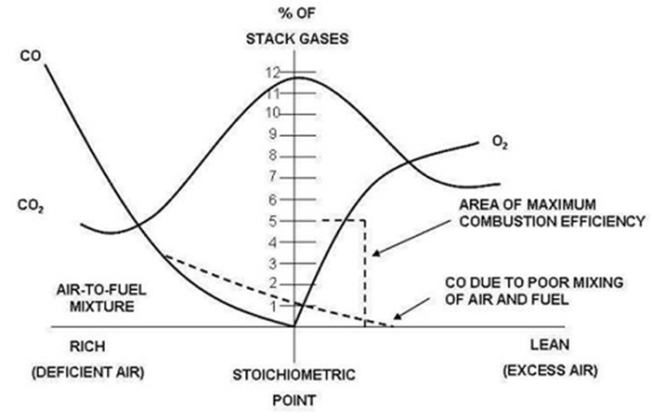 Figure 1 shows the key gas measurements relating to the ideal combustion stoichiometry. In boiler combustion, if excess air is not added to the process, unburned fuel, soot, smoke, and carbon monoxide exhaust will create additional emissions and surface fouling. From a safety perspective, accurately controlling excess air reduces flame instability and other boiler hazards. The challenge presents itself at the lower end of the firing range. In general, as the firing rate of a boiler decreases, there is a corresponding increase in excess air requirements, leading to lower efficiencies at the lower end of the firing range. Boiler manufacturers usually provide boiler efficiency curves over several firing rates (e.g. 100%, 75%, 50%, 25%) based on laboratory results. These curves, however, rarely go below 10% of the firing rate (10:1 turndown ratio) and if they do, it should be important to take note of the excess air levels. So how does this relate to the turndown ratio? As seen in Figure 1, one of the main combustion by-products is carbon dioxide (CO2). While adding excess air lowers the combustion efficiency, the effects are even more unfavourable when operating condensing boilers. As excess air is added to the combustion process, to maintain stability, CO2 production reduces, which is the case at a reduced firing rate. This would result in a reduction in the dew point temperature at which condensing of the combustion gases can occur, as shown in Figure 2. 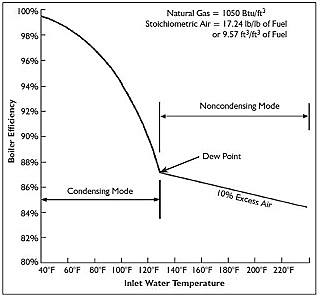 As the excess air level increases, the flue gas dew point decreases. A typical excess air level for a natural gas-fired condensing boiler is around 5% O2 (or 30% excess air) which produces approx. 9% CO2. This correlates to a flue gas dewpoint of 130°F. 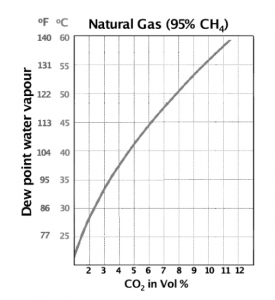 The return water temperature relative to this flue gas dew point is the most essential factor in achieving condensing efficiency as shown in Figure 3. Therefore, in order to begin achieving condensing performance, the return water temperature must be below 130°F. If additional excess air is added with the goal of improving turndown, the return water temperature will be altered. By increasing the excess air level as required, which produces approx. 6% CO2, in this example, the flue gas dew point now drops to 116°F. In order to achieve the same level of condensing performance, the return water must be below 116°F. At a reduced firing rate, the demand on the heating system will be low. This would suggest that, at a constant pump speed, the return water temperature will increase resulting in the boiler operating outside of the condensing zone – lowered efficiency. Condensing boilers achieve high efficiencies by recovering the latent heat (approx. 10 – 12% available) from the combustion process. Based on the observations from the effects of excess air on the dew point temperature, closing the window of condensing (condensing mode) would mean eliminating the opportunity to achieve the highest efficiency possible. More excess air is required for lower firing rates to maintain flame stability and reduce harmful emissions. However, up to a certain point, there is an efficiency penalty as a result of the addition of excess air (see Figure 1). We have seen that higher excess air makes it harder for the boiler to produce the condensate that is the result of the higher energy recovery. And that’s the heart of the problem. High excess air equals low dew point and that equals less condensing hours in a heating season and therefore lower efficiency. It is critical to understand that excess air must be increased to achieve a high turndown and the result is that the flue gas dew point is decreased, making it more difficult, if not impossible, to condense. By trying to save energy with a very high turndown on each boiler, we actually move further away from the flue gas dew point, which dramatically decreases a condensing boiler’s efficiency. If the combustion is consistent overall firing rates, then you can determine the combustion efficiency and dew point of the combustion gases will remain consistent. It is therefore important to request for the combustion efficiency curves at the specific turndown ratios. Let’s look at a more practical example, a hot water system with 10 boilers each with a 20:1 turndown ratio would result in a 200:1 turndown ratio of the entire system. Is this really necessary? How much turndown is too much? There have not been many published studies evaluating the performance of high turndown ratios and determining an actual turndown “sweet spot” for condensing boilers. Johnston Boiler Company conducted a study in 2003 to compare the energy losses and resulting impact on the boiler efficiency between a boiler operating at 4:1 and 10:1 turndown ratio . The result from the study indicated that there was no significant advantage of operating a 10:1 versus a 4:1 boiler turndown based on the insignificant differences in the energy losses and boiler efficiency. Another study by Dunphy Combustion Ltd was also conducted to determine the effects of turndown ratio on the fuel costs . The results showed that there was significant fuel cost savings (> 15%) when operating at 5:1 turndown versus a lower turndown ratio. However, as the turndown ratio is increased from 5:1 to 10:1, the fuel cost savings become less significant (<2%). The cost of a 5:1 turndown ratio burner is on average 20% less than a 10:1 burner. It would, therefore, be more beneficial to find alternate solutions to meet partial load demands instead of very high turndown ratio boilers given the higher costs and insignificant savings at the very high turndown ratios. A modular approach enables the increasing load to be met by more boilers operating at part-load conditions, which, if coinciding with favourable system temperatures, will allow high part-load condensing performance from the boiler plant. As system demands increase, boiler load will increase towards full capacity. At this point system return temperatures should be low, and the boilers will continue to operate in condensing condition, delivering an efficient energy supply. It also provides a level of redundancy in case of equipment failures. Short cycling during low load conditions reduces the boiler’s thermal efficiency. It also increases emissions, increases maintenance and shortens equipment life. Another way to avoid short cycling is to provide adequate thermal mass within the heating system. Because of its excellent heat storage characteristics, adding water to the system is the best way to increase its thermal mass. The device that contains this water is often called a buffer tank, because it “buffers” (e.g., helps protect) the heat source against the undesirable effects of short cycling. This will eventually result in a reduction in the wear and tear of the burner components. Therefore, instead of installing a boiler with a very large turndown ratio – which may eventually lead to reduced efficiencies, flame instability, and ignition issues at a reduced firing rate, implementing these options in a system will ensure excellent performance throughout each boiler’s firing range at a reasonable turndown ratio. Kevin Carpenter, Chris Schmidt, Energy & Resource Solutions, Kelly Kissock, University of Dayton, “Common Boiler Excess Air Trends and Strategies to Optimize Efficiency,” 2008 ACEEE Summer Study on Energy Efficiency in Buildings. Department of Energy (DOE). 2007. Energy Tips – Process Heating. DOE/GO-102007-2483. Washington, DC: U.S. Department of Energy, Office of Energy Efficiency and Renewable Energy.